General:No curfew.We promote Friendship, Fun and ‘Fiesta’ in a homely environment where comfort and harmony are always present. Our stunning Roof top Pool is a magical oasis – perfect for lounging and dreaming and inspiring your soul. By day and by night its atmosphere transforms with the light, offering you the perfect set for making new friends. There are meal nights, themed parties and even limbo dancing nights – all around our garden bar! 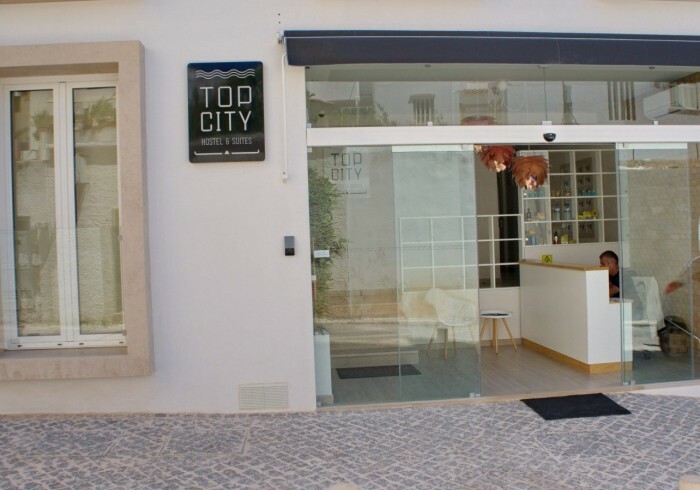 In Top City Hostel you will feel in a unique hostel with a fabulous interior design that will make your stay cool and unforgettable. Whether you want a private room or just a comfortable bed in one of our shared dorms you will find the perfect accommodation for your budget. Relax, make friends in our awesome and popular terrace with a cosy swimming pool, best choice for sunny days!This jewel is set in the heart of Lagos within the Old City Wall where you can find great shops, amazing restaurants, tons of history & culture and last but not least its famous night life circuit. To be a little bit more exact, we are near to some of the most important landmarks of the city such as Mercado dos Escravos, Arco / Porta de São Gonçalo or Forte da Ponta da Bandeira, amongst other important spots of the city.We offer accommodation for venturesome travellers by means of dorms with diverse capacities as well as accommodation for those guests who are seeking more tranquillity environments by means of double rooms ideal for couples. We love the abundance of activities available in Lagos. A few of these have become our favourites and we can help planning your day to make sure you will experience the most of what the City offers. Our passion and knowledge for Lagos will make your days unforgettable. You will find the most advanced technology in security, with fingertip keys, 24 hours reception, security cameras and other facilities such us a free wifi access, bar, kitchen, communal lounge. – Two free internet stationsTop City Hostel Policies and Conditions:Cancellation policy: 24h before arrival.Check in from 16:00 to 23:00 . Check out before 11:00 .Payment upon arrival by cash, credit cards, debit cards. This property might pre-authorize your credit card.Taxes included. General: No curfew.